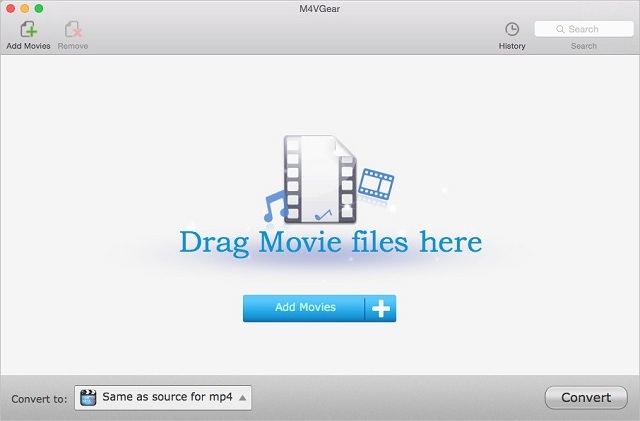 M4VGear is the fastest DRM remover in the market which can remove DRM from your iTunes videos at 20X faster speed on Mac OS. It can convert all M4V video files including your iTunes purchases or rentals to unprotected MP4 format with perfect output quality. The rented video from iTunes is only available within 30 days, and you must finish watching the video in 24 hours when you start to play the video on iTunes. After removing DRM, you can keep iTunes rentals forever without caring for the expiration. Besides, M4VGear is highly compatible with Mac OS 10.9 and iTunes 11.1.3, and will constantly upgrade with the latest system. Thanks to the intuitive interface and self-explanatory options, we believe you can handle M4VGear at the first sight. With batch conversion support, you can save your time by creating a batch list of M4V videos from iTunes' library, and convert them all to MP4. Then you can watch them on any video player and device as you like.